Molly Grogan reviews the extended run of A.S.M. Kobayashi’s documentary art performance. For Alison S. M. Kobayashi’s one-woman performance, Say Something Bunny!, to get to the stage, it took a lot of hard work and many strokes of luck. For starters, those include how an audio wire recorded by a Jewish family in NYC in 1952 was sold in an estate sale in 2011 against the inheritors’ intentions and then made it to Kobayashi via a friend. Luck was also on Kobayashi’s side when the family, who made the recordings for the novelty of the experience, under the urging of one of its adolescent members, happened to gather on an anniversary that also corresponded to a well-known football rivalry, and discussed its outcome in explicit terms on the wire, effectively giving it a time stamp, so that Kobayashi could discover the names of the couple married on that same date. More luck that the family had a musical flair and sang songs from the period, helping Kobayashi identify the family’s cultural references and get a nascent feel for who they were (incidentally, you might be surprised by the knack for conversation of our pre-digital ancestors). Luck too, and perhaps the greatest stroke of it, that the adolescent making the recording grew up to be a second rate but rather notorious lyricist (David Newburge) who wrote a song each for Liza Minellii and Petula Clark, but also the pornographic Broadway disaster, Stag Movie. In other words, unlike perhaps a recording of your family shooting the breeze about jobs, personal news, health or hobbies, this one inadvertently left enough clues for Kobayashi to find them (for example, at a dinner for their neighbors, they dropped enough clues for Kobayashi to track them to their street in Long Island). Best of all, they had a pretty interesting story to tell, about middle class mobility and mid-century notions of gender and sexuality, too. If you didn’t already guess it, Say Something Bunny, which is on an extended run since it opened last spring in Chelsea (it premiered in Kobayashi’s hometown, Toronto, in 2016), is the outcome of a massive labor of love, the scope of which becomes clear though a two-hour multimedia performance. Kobayashi is an interdisciplinary artist and project director at UnionDocs in Williamsburg, a center for documentary art that is “on a search for urgent expressions of the human experience” (her co-creator on the show is also UnionDoc’s founder and artistic director, Christopher Allen). Suffice it to say, Kobayashi landed on a gold mine with these crumbling audio wires but she was well-placed to do the job, and the right person for it, too. In fact, as it becomes abundantly clear over the course of her performance, she took up the ethnographic quest that was calling out to her from that old audio recorder with vision, dedication and boundless enthusiasm. The show skews somewhere between a history lesson, a museum tour, a murder mystery dinner (with the audience playing the characters on the tape), homemade YouTube videos (live video of Kobayashi in wigs and paraphernalia…), and a knowingly self-conscious downtown theater performance. During the six years she spent researching and sleuthing to find out who the people were on the wire, she turned up quite a bit of documentation, including archival film, news clippings, photos, LPs, advertisements, playbills, drawings, social security registers and census records. After having taken enormous care to chase down every cultural reference the family drops – George M. Cohan’s “Yankee Doodle Boy” (1904), Sinatra’s duet with Rosemary Clooney, “Peachtree Street” (1950), Jo Stafford’s “Shrimp Boats” (1951), Eddie Fisher’s 1954 hit “Fanny”… – and every cultural artifact she can find about them (David’s mother, Juliette, was a child actor in silent movies, for example) she treats each one as a precious object and includes it, at length sometimes, in her narrative, both discursively and visually. More importantly, however, she teases out the importance of each of these items in the family’s narrative : what it meant for Grandpa Sam to sing “Yankee Doodle Boy,” how Juliette’s truncated career as a child actor shaped her personality, what David’s recordings reveal about his frustrated desire to earn his family’s respect… She has to rely on her imagination at times, but when she finally meets Larry Newburge, the last surviving family member, we learn that her intuition was pretty darn good. 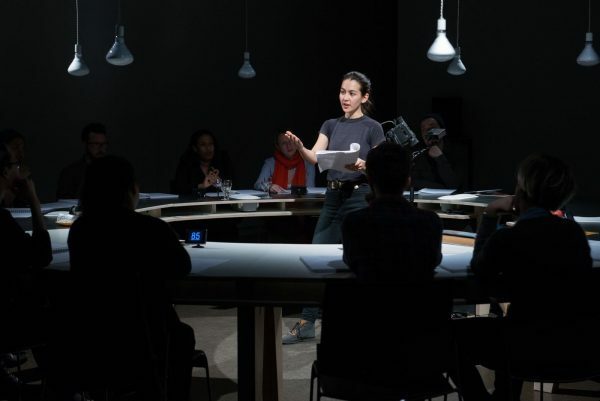 Giving her listeners so much detail to absorb, Kobayashi has astutely chosen to engage the audience in her narrative as much as she can, giving everyone a “character” to represent around the circular white table where we are seated and that is the show’s stage. Performatively, this allows her to address each of them as a physical presence in the room, but it also helps us keep all these voices and names straight in our minds. That alone is a a bit of a cognitive feat but it is helped along by copies of the transcript of the wires, which we are cued to page through, and which contains yet more cultural artifacts, and by Kobayashi’s playfully exaggerated role playing, when she sometimes dons a wig to act a scene as one or another of the family members, adding comic punches to the ethnographic research. The result is slightly cloying at times, especially when paired with the actress’ almost beatific glow when she discusses the miracles of her discoveries, but, given the effort that clearly went into bringing to fruition this fascinating show that is as much about artistic process as it is about human experience, she can beam away all she likes. You feel that Kobayashi considers herself really lucky, graced even, to have been given the audio recorder with its last two remaining wires, and, with them, the opportunity to tell this family’s story. That’s a testament to her engagement as a documentary artist. In Say Something Bunny, she marshals an ethnographer’s appreciation for cultural and historical context, a genealogist’s relish for placing relations on a family tree, a private investigator’s instincts to follow any lead and connect all the dots, and a storyteller’s flair for filling in the empty spaces. But it also says something about her capacity for empathy. This isn’t just a project to her; it’s a family’s lives she is holding in her hands. In reality, the lucky ones in this transaction were the Newburge’s and particularly David, the minor-league lyricist. Clearly, his adolescent self that we hear on the tapes wanted to leave a record of his family (and his role in it) for posterity but since his hopes were stymied by a malfunction in the wire recorder, what are the chances that his longing for recognition would someday be realized, in spades, as Kobayashi’s Say Something Bunny? Molly Grogan covered French and international theater for 20 years in Paris. She has written on theater for The Village Voice and American Theater and managed an Off-Broadway theater company. She is a translator of fiction and non-fiction with a Ph.D. in Francophone postcolonial literature and a Masters in social linguistics.